Here is a comfort food we love, all the vegetables in one pan, melt in your mouth roast and a delcious sauce over Grandma's freshly made pasta! In a large cooking bag, roast the meat to cooking instructions with seasoning. Take roast out and rest. Slice into large pieces and set aside. In a large deep saucepan or fry pan. Add olive oil, minced garlic, peppers, mushrooms, zucchini, beans and carrots. Saute in the garlic and oil around 4 minutes stir in the flour mix well. Add the wine, broth and simmer with potatoes until tender around 15 minutes, add tomatoes around 5 minutes before vegetables are done to your liking. Add the meat to this and heat through around 5 more minutes. In the meantime cook fresh pasta in salted water al dente. Drain, add 2 tablespoons olive oil, 2 tablespoons grating cheese, toss with some salt and pepper to taste. Set aside. To serve, add some pasta to the dish, top with meat and vegetables, garnish with some parsley and more grating cheese. I just would like to give a huge thumbs up for the great pics, u just made me hungry. 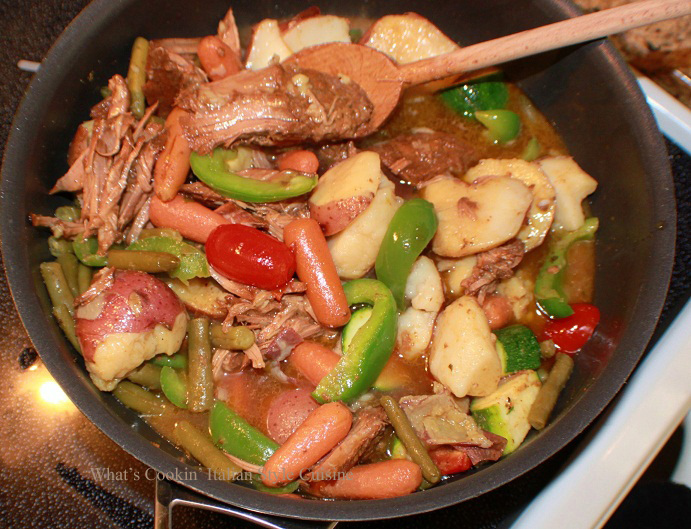 Wow, this recipe takes pot roast to places it has never been. Italian veggies, pasta, cheese I'll take a plateful please. Oh my gosh, that looks so fantastic.I wish I could be in the kitchen just to smell the finished roast, let alone eat it. I usually serve my roast with potatoes, but yeah, I'll take freshly made pasta anytime! Great idea and I could go for a big dish of it. Most things are better over pasta. Oh my! This looks so delicious. I bet this smells amazing when in the oven. I've never served my roast with pasta before but I'm not one to pass up a plate of it. Great recipe. Looks just great, Claudia. A perfect fall meal. I have to confess that, as much as I love it, and even though I have a brand spanking new pasta machine, I've never made it. 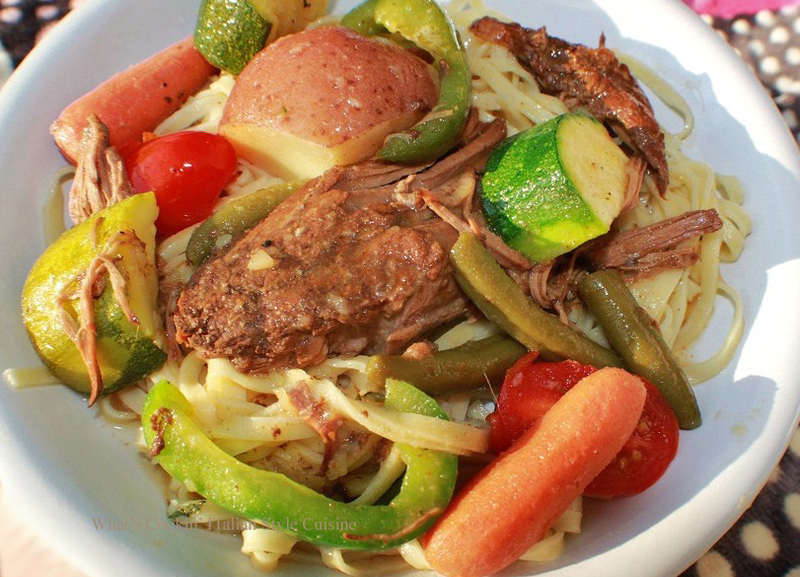 I want that pot roast and veggies and pasta! plenty of fresh vegetables on this dish. This is what I call proper, healthy and tasty Italian cuisine. Brava Claudia. A nice comforting meal for the fall weather. I really need to take the time to make fresh pasta - boxed just isn't the same. This looks like perfect comfort food! Simply delicious! Hi, sorry I'm late in commenting, I miss out so many of your delicious posting. Another comfort food, all in one pot. I love this, it look excellent. Love the vege combination.